Be positive think positive with Be That Books! Home A Thought on Positive Thinking Love Yourself! 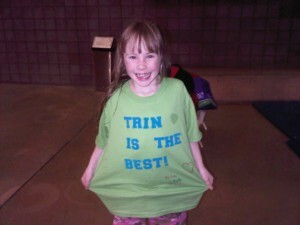 Here is my daughter Trinity. She made this shirt the other morning for herself, and then proceeded to wear it for 3 days straight! She is demonstrating here that you are never too young, or too old, to start loving yourself. It seems easier to love yourself when you are young, and you have not had the experience of messing up or making mistakes in your life. No matter what your experience, or your hardships, today is a new day. The past is just that… past, gone, done. Today is a new day, so start today with loving every piece of yourself. Forgive yourself and open yourself up to the love that you have already inside of you. So start proclaiming “I am the Best!” everyday. Because you are. You deserve to love yourself and you are worth it. Namaste!